EA is continuing its streak of acquiring promising independent projects with the announcement of three new games from three different developers. After apparent successes publishing Deathspank and Shank on various platforms earlier this year, EA has turned to three more independent games that it hopes to bring into the limelight. EA recently announced that it'll be publishing Fancy Pants Adventures, Gatling Gears, and Warp. Fancy Pants Adventures will be an Xbox Live Arcade and PlayStation Network version of Brad Borne's flash game of the same name. 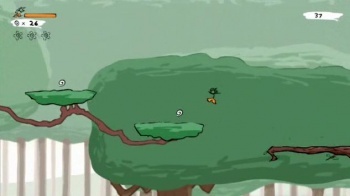 It follows a stick figure wearing a fancy pair of pants, go figure, as he speedily runs through various platforming levels while picking up swirly collectibles and other items in the search for his sister, Cutie Pants. The browser version of Fancy Pants has reportedly been played more than 100 million times, but the new version under development by Borne and Over the Top Games will take the previous adventures and add a brand new world, new modes, and a new story. It'll be available in Spring 2011. Gatling Gears is coming out of Vanguard Games, an independent developer made up of employees from Guerrila Games and the team that previously brought us unique turn-based strategy title Greed Corp. Gears is set in the same steampunk universe of Mistbound as Greed Corp was, and will feature similar elements such as collapsing land, but will be a twin-stick shooter instead of a strategy game. The title's hero, Max Brawley, must "fill the air with lead" as he goes up against a corporation trying to steal the world's natural resources. Gatling Gears will launch on XBLA, PSN, and the PC also in Spring 2011. Warp is being developed by Trapdoor, a studio located in Montreal, and is billed as a "unique stealth action game." 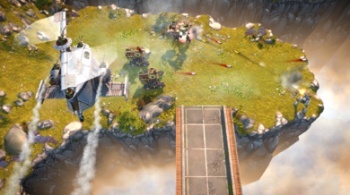 Details about the game are scarce, but a press release says Warp features "a top-down sci-fi world with a distinctive art style, addicting levels, hazardous traps and challenging puzzles." It's not a lot to go by, but is at least enough to make me want to see what the hell the game is. Warp is scheduled for release in Summer 2011 on XBLA, PSN, and the PC. 2D Boy's Ron Carmel recently said that he wants big publishers to set aside funds for riskier, more "indie" projects that fall outside of the mainstream. The initiative by EA Partners to seek out strong independent developers and attempt to bring their titles to a broad audience isn't quite what he was talking about, but it's close. Deathspank and Shank were pretty cool games, so I think we should all look forward to the possibility of these three new projects being pretty cool too.